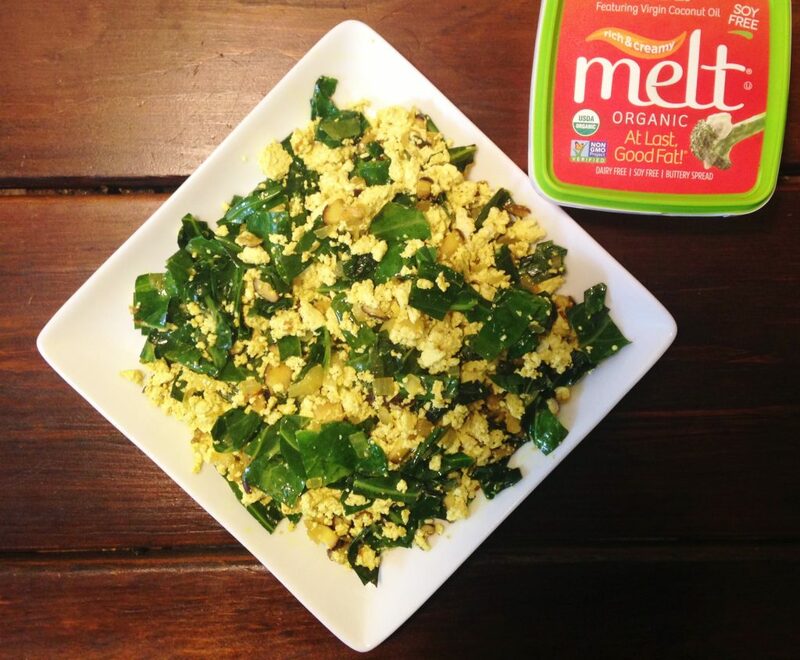 You don’t need to be vegan or allergic to eggs to enjoy this tofu scramble. A surprisingly filling, yummy, and nutritious dish, tofu scrambled with almost any mix of vegetables will leave you feeling full, but not heavy, and satisfied for several hours. Tofu is an ancient food, wonderful for highlighting the textures and flavors of other ingredients, and an excellent source of protein! This recipe yields two to three servings. The tofu cake needs to be lightly pressed in order to remove some of the water content. With a dish towel folded in half, loosely fold the dish towel around the tofu so the cloth is in contact with the top and bottom sides of the tofu cake. Place the towel-wrapped tofu on a small cutting board on the counter. Place a second, small, rigid cutting board on top of the wrapped tofu so the board balances in place. Place a weight on top of the cutting board, such as 2 to 3-14 oz cans of tomatoes, bean, soup or whatever you have in the cupboard. You may have to check on the press to make sure it is balanced and not leaning to one side. The weight should not be so heavy that the tofu cracks on the sides. Less weight with a longer press time is easier to balance. Press for at least 15 minutes, preferably longer. With a fork or pastry knife, “scramble” the tofu cake in a mixing bowl until it has reached the desired consistency. Add the Melt Organic and chopped onion to a skillet, and turn the stove on medium to medium-low heat. Once the onions have softened, add the chopped mushrooms, salt, and pepper and sauté until mostly cooked. Add the turmeric (and more Melt Organic if needed), and sauté for a minute or two, making sure the turmeric is evenly distributed within the scramble. Add the chopped collard greens. Sauté the collard greens until they have started to soften, but are still “fresh”. Turn the heat to medium-low, and stir in the “scrambled” tofu until it is evenly colored by the turmeric. Add the creamer and sauté the scramble long enough to bring it back to temperature, about a minute or two. The creamer slightly moistens the scramble and softens the tofu. Serve and add salt or tamari to taste.